Safety is an important issue in the operation of the steel plant. It has implications for cost, delivery, quality, and social responsibility. Minor accidents can interfere with production in a variety of ways, and a serious accident can shut down the entire operation. Safety is sometimes equated with preventing errors. This seems innocent enough, but it is a potentially limiting assumption. There is no question that an understanding of error is fundamental to the safety of the employees. However, there are differences of view as to whether the focus of safety should be on error or on harm. The safety culture of an organization is the product of the individual and group values, attitudes, competencies and patterns of behaviour that determine the commitment to, and the style and proficiency of the safety programs in the organization. It is founded on the individual attitudes and values of everyone in the organization. A strong organizational and management commitment is also implied. Safety needs to be taken seriously at every level in the organization. Organization with a positive safety culture is characterized by communications founded on mutual trust, by shared perceptions of the importance of safety, and by confidence in the efficacy of preventative measures. World Steel Association has indicated the following six principles for health and safety. Measuring safety is, however, not solely about measuring harm. Assessing safety by what has happened in the past, although informative, does not by itself tell one how dangerous it is now or will be in the future. Safety is concerned with the myriad ways in which a system can fail to function. Some of these failures may be familiar, even predictable, but the system may also malfunction in unpredictable ways. Safety is partly achieved by being alert to these perturbations, responding rapidly to keep things on track. A prime challenge in measuring safety is clarifying indicators that can be validly measured as rates. Most safety parameters are difficult or impossible to capture in the form of valid rates for several reasons namely (i) events are uncommon or rare, (ii) all do not have standardized definitions, (iii) surveillance systems generally rely on self reporting, (iv) denominators (the populations at risk) are largely unknown, and (v) the time period for exposure is unspecified. All of these may introduce bias. 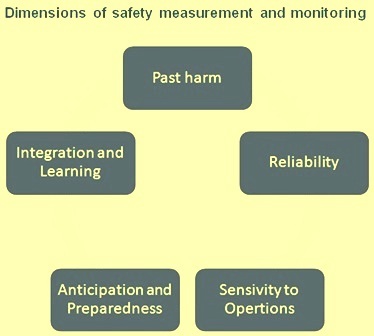 The dimensions of safety measurement and monitoring (Fig 1) are to address the different facets of safety. These in turn must provide a comprehensive and rounded picture of the safety in the organisation. These dimensions can be grouped into the following five broad classes. Past harm – It encompasses both psychological and physical measures. Reliability – It encompasses measures of behaviour and systems. Sensitivity to operations – It is the information and capacity to monitor safety on an hourly or daily basis. Anticipation and preparedness – It is the ability to anticipate, and be prepared for problems. The three important aspects in the measurement of safety areas are as follows. To address the many technical and conceptual issues inherent in any attempt to measure safety. There are a number of different perspectives, and a need for a clear overview of the core issues. To understand how safety measures can be effectively used in practice by the organization to monitor and improve safety. To clearly communicate the findings to a number of different audiences. Measuring performance is one of aspect of achieving good safety standards in the organization. However measuring of safety performance is far from simple, particularly when comparisons are attempted and made even more complex because measurement is normally of negative occurrences i.e. things which the organization does not want to happen. The information for safety measurements not only concerns the number of incidents that occur (number of fatalities, lost time injuries, medical treatment cases, first aid cases, near misses or safety deviations) but also all the actions taken to avoid further similar incidents such as hazard identification and risk assessments, safety audits and safety training programmes put in place. Safety measurement and monitoring has evolved considerably in steel industry in response to a deepening understanding of the nature of safety and increasing regulatory, public and government pressure. In the 1970s and 1980s, steel industry realized that measures of injury and incidents are needed to be complemented by indices that reflected a more proactive approach to safety. ‘Lagging indicators’ is the term used in industrial settings to define measures that are made after an incident or event has occurred and which assess different types of outcome. These are the reactive measures of the organization’s safety performance. Incident reporting is a lagging indicator widely used in the steel industry to monitor safety performance. However, it is critical to realize that incident reporting of all kinds is used to supplement and complement other more systematic measures of safety. Different safety performance indicators which are measured presently in the steel industry are given below. Industrial accident – It is an unintended event due to an unsafe act or unsafe condition or a combination of both, which may or may not result in property damage, personal injury, work interruption, product damage or a combination of these. Industrial injury – It is an injury arising from an industrial accident that occurs whilst a person is working for the organization or is on the premises of the organization for purposes in connection with or arising out of and in the course of his work, but which may not necessarily result in absence from work. Lost-time injury – It is an industrial injury causing loss of time from the job on which the injured person is normally employed beyond the day or shift on which the injury occurred. In addition, cases where loss of time does not immediately follow the injury, but where there is a direct relation between absence and injury, are generally regarded as lost-time injuries. Fatal injury – It is an industrial accident resulting in a fatal injury to either the organizational employees, contractors carrying out work for the organization or other persons where these result from an industrial accident arising from organizational activities. Severity rate – It is the 1000 times the ratio of total number of days lost and total time of hours worked. Lost-time injury frequency – It is one million times the ratio of lost time injury number and the total number of hours worked. A widely used safety measure in steel industry is graphical representations or signs displaying to the employees and general public the number of consecutive days since the last incident occurred. Different types of incidents can be used such as lost-time injury related incident, slip, fall or maintenance-related incident. This provides a visual reminder to the employees of specific types of incident and how successful the organization has been in preventing them. Reactive safety performance parameters do not measure how safe the operations in the organization are now but how harmful they have been in the past. While monitoring injuries is obviously a necessary component of any serious safety management system there are several reasons for not relying too heavily on measures of injury to reflect the overall safety of a system. The following are some of the more important aspects. Under reporting – An emphasis on injury rates as a measure, particularly when related to reward systems, can lead to such events not being reported so as to ‘maintain’ performance. Whether a particular event results in an injury is often a matter of chance, so it will not necessarily reflect whether or not a hazard is under control. An organisation can have a low injury rate because of luck or fewer people exposed, rather than because it manages its safety effectively. Positive reactive safety performance parameters can lead to complacency. These performance indicators can be used simply as a judgment of safety performance, rather than to understand the contributory factors and root causes behind the injury rate. Also there may not be necessarily any relationship between ‘occupational’ injury statistics (such as slips, trip and falls) and control of major accident hazards (such as loss of containment of flammable or toxic material). Steel organization which becomes complacent with positive reactive parameters are lulled into a false sense of security about the safety of their operations. The definition of safety is becoming more sophisticated these days. The focus is moving from counting harms after the event towards looking at hazards that might give rise to error, or safety failure before harm has occurred. This approach has its own challenges as even the definition of error can be ambiguous and has been interpreted by some as deviation from a standard process or rule. The measurement and monitoring of safety in steel industry poses a number of difficult problems. For instance, an organization may have to struggle to understand whether it should focus on error, harm, reliability or other indices. The organization may also have to struggle to provide a convincing account of the positive face of safety which encompasses both the achievement of keeping employees safe in a hazardous environment and the constant monitoring, reflection and action needed to keep the organisation running safely. The measurement of safety is also critical to many current and future safety programs, and to the production of evidence for the impact of these improvement programs. High risk industries like steel industry are characterized by the shift they have made from measuring and responding to specific incidents of harm to assessing the presence of conditions that create safety. Such industries actively manage the environment to both manage the hazards that give rise to risk and also to create resilience in the face of unanticipated risks. For knowing how it is to be done, the organization must know the methods, tools and indicators which are being used, and should be used for measuring safety. In recent years steel industry is modernizing its approach towards safety. The new approach is more towards to learning from failure. Four key areas which have been identified as ‘must do’s for improving the safety are as follows. Unified mechanisms for reporting and analysis when things go wrong. A more open culture in which errors or failures can be reported and discussed. Mechanisms for ensuring that where lessons are identified the necessary changes are put into practice. In the modern approach to safety measurement, leading indicators play an important role. Leading indicators broadly focus on identifying precursors, conditions, events or measures before an incident or event has occurred and which purportedly predict whether an event will occur. These indicators involve forms of active monitoring of key control systems or ‘activity’ indicators that show if the organization is taking actions believed to lower risk. The essence of leading indicators is that they are proactive and measure variables that are believed to be indicators or precursors of safety performance so that safety is achieved and maintained. Examples of leading indicators are safety management system audits, safety cases, safety culture surveys and safety inspections etc. A combination of factors has prompted the evolution from a solely reactive measurement approach to the recognition that safety needs to be managed and measured through the use of a balanced set of reactive and proactive safety measures. In steel industry, the following factors have influenced the evolution of approaches to measuring safety. Reports on major disasters that emphasized the failings of the organization to protect the safety of the employees. Increased awareness that lost time injury and accident rates do not predict major disasters. Low lost time injury rates may lead to management complacency about safety. Maturity in understanding that safety measurement should be assessed against design expectations rather than simply satisfying the requirements of the regulating agency. Steel industry normally use a toolbox of safety measures combining lagging and leading indicators, giving ‘a balanced scorecard approach’. Lagging indicators certainly provide useful high level information but they should not be used as targets against which the organizational performance is assessed. Proactive measures (leading indicators) are more relevant and effective performance indicators as they foster an active engagement in safety which is not entirely dependent on recent past performance. The following are the guiding principles for measurement and monitoring of safety. A single measure of safety is a fantasy. The search for simple metrics has at times led to claims that it is possible to use a specific measure as a generic indicator of safety performance. In steel industry there are too many different activities, too many different dimensions of safety and too many factors that influence safety. These cannot be encapsulated in a single measure. Safety monitoring is critical and it is essential that it should receive sufficient recognition. Steel industry uses a variety of formal and informal approaches to elicit safety information. Timely action and intervention to thwart potential safety risks is the key component of sensitivity to operations, which does not always fit well with rigid structures of the organization. Regulatory authorities normally place considerable emphasis on monitoring harm and incidents, but the critical role of an organization’s approach to monitoring safety does not always receive sufficient attention. Employees are to be empowered with the freedom and authority to monitor and intervene when necessary. By learning from past events, by listening and perceiving, and by foreseeing future areas of risk, safety managers operationalise these dimensions of safety. They are an essential but all too often underused defence in preventing the harm. Integration and learning- There is a necessity to invest in technology and expertise in data analysis . Safety information is normally fragmented within the organization. Usually the organization has an array of safety relevant information. Integrating this information at an appropriate level and in a usable and comprehensible format is necessary and is probably the greatest challenge. The organization that has an evolved approach to safety measurement and integrated data management capacity, are able to collate safety information from many different sources in a timely way. Mapping safety measurement and monitoring across the organisation – Safety measurement and monitoring has a number of dimensions and must, to some extent, be customized to local settings and circumstances. In practice, the organization tends to rely solely on generic safety indices such as incident reporting. In fact, organization must consider (i) what kinds of dangers are prevalent, (Ii) what features of precautions are reliable, and (iii0 how to monitor, anticipate and integrate safety information. Since danger can take various forms and all different categories of danger must be considered. Assessing the reliability of key processes, behaviours and systems by sampling at defined intervals is also fundamental. All these information need to be integrated at the different levels of the organization and also set alongside wider quality and financial metrics. A blend of externally required metrics and local development is normally needed. Safety measurement, and particularly safety monitoring, must be customized to local settings and local circumstances in the organization. This is not to advocate a free for all of locally derived metrics. There are many indices that are agreed nationally or even internationally. But day-to-day monitoring, anticipation and preparedness are necessarily local activities. There need to be a balance between the standardization of safety metrics with a recognition that there is not a ‘one size fits all solution’ where safety measurement and monitoring is concerned. Clarity of purpose is needed when developing safety measures. The criteria and purpose for safety measures are to be clear. The safety measures must answer (i) the purpose for which the safety measure is being developed, (ii) how and in what context the safety measure can be used, (iii) whether it is measuring what it claims to measure, (iv) whether the metric can be used to reliably detect or demonstrate deterioration or improvement, and (v) whether the metric can have untoward consequences. Empowering and devolving responsibility for the development and monitoring of safety metrics is essential. Steel industry has recognized the need to empower managers, supervisors and operational staff to develop safety metrics suitable for their specific operations. Further there has to be need to have a flexible approach when developing safety measures. Some types of measurement introduce perverse incentives that can lead to ‘ticking the box’ or behaviour that circumvents the original purpose of the safety measure. That is to say, certain safety measures create behavioural side effects where managers and operators demonstrate that they can meet a target, but they do so in a way that undermines the intended purpose of the measure. One potential risk to the evolution of safety measurement is fragmentation of key safety information across the organization. Further the fragmented approach to regulation is potentially a threat to safety. Worse, equating safety data generated for satisfying the regulatory authorities provides false reassurance and allows organization to miss glaring safety issues simply because they fall outside the regulatory framework.